This year Super Mario Bros. celebrates its 30th anniversary, but Mario as a lonely brother has been around longer than that. Created by legendary games designer Shigeru Miyamoto, the first appearance of Mario was actually as ‘Jumpman’ in Donkey Kong in 1981. 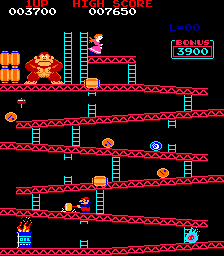 In the original game, Mario tries to rescue the damsel in distress known as Pauline from the ape Donkey Kong. Over the years, Mario has appeared in many Donkey Kong games, including those such as the sequel Donkey Kong Junior and the remake on the Game Boy. The first Mario Bros. game, which saw the debut of Luigi, was introduced as an arcade game in 1983, as well as Mario Bros. on the Game and Watch in the same year. The popularity of the Mario Bros. didn’t occur until later, with the Super Mario Bros. game on the Nintendo Entertainment System (NES) in 1985. The sequel Super Mario Bros 2. was released in 1986, and Super Mario Bros 3. in 1988 (1990 worldwide). The basis of all the Super Mario Bros. games sees Mario traveling across the Mushroom Kingdom to save Princess Toadstool from Bowser, as well as his Koopalings in Super Mario Bros 3. In the original Super Mario Bros. Mario had power ups such as the super mushroom and fire-flower, but Super Mario Bros. 3 included extra power-ups such as the super leaf and the frog suit. Super Mario Bros. 3 is widely considered by many to be one of the greatest video games of all time. The popularity of the game even had an animated television series made based around it. As well as on home consoles, Mario has appeared in many hand-held console games. Famous Game Boy appearances of Mario included Super Mario Land in 1989, Dr Mario and also Wario Land. The Game Boy saw Mario in many solo sporting outings, including Mario Golf and Tennis. The rest of the hand-held consoles over the years have continued in the trend to release many new Mario titles, as well as re-making old games. Super Mario World on the Super Nintendo Entertainment System (SNES) saw the introduction of the much-loved dinosaur Yoshi. Yoshi reprised his role as the Mario Bros. sidekick in the SNES game Super Mario World 2: Yoshi’s Island. The SNES also had the first Mario Kart game in the series in 1992. On the Nintendo 64, we saw the first 3D Mario game, Super Mario 64. Other big Mario games that started out on the N64 included the first in the popular Super Smash Bros series, and the initial Paper Mario game. The GameCube saw another 3D Mario game with Super Mario Sunshine, which deviated from the usual Mushroom Kingdom rescue story by seeing Mario travel to Isle Delfino. On Isle Delfino, Mario had to save Princess Peach from the evil Shadow Mario. With the Wii remote and nunchuk attachment for the Wii, sports games became popular, and Mario was no stranger to them. Mario and Sonic at the Olympics was the first game, followed 2 years later by Mario and Sonic at the Winter Olympics. Another original Wii game, Super Mario Galaxy, saw the return of the familiar storyline of Mario rescuing Peach from Bowser; this time however, the game was set in outer space and Mario had to travel across galaxies to save her. There have been many Mario games on the Wii U, but one in particular that deserves a mention is the creative Super Mario Maker that was recently released. Unlike any other game, Super Mario Maker allows the gamer to create and play their own custom Mario levels, and to share them online. With the chance to create something new, or pay homage to your old favourite Mario level, Mario Maker has quickly become a fan favourite. Having appeared in over 200 games in his 30 years, Mario has definitely managed to stand the test of time. Considered to be the best-selling video game franchise of all time, Mario is set to have a long-continued history with Nintendo and the Nintendo fans that love him.